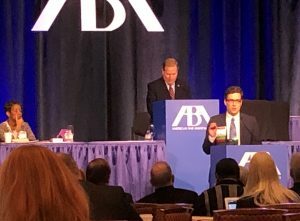 American Bar Association’s Midyear Meeting | Webber & Thies, P.C. 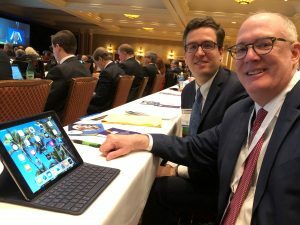 Shareholders John Thies and Daniel Thies attended the American Bar Association’s Midyear Meeting in Las Vegas on January 25-28. John and Daniel are pictured attending the ABA House of Delegates. John serves as an Illinois State Bar Association Delegate in the House, while Daniel was given “privileges of the floor” to speak to the House in favor of a resolution advanced by the Council of the ABA Section on Legal Education and Admissions to the Bar.